The restaurant "Old Arba", It is interesting, Tours to Uzbekistan, Restaurants of Samarkand, Restaurants of Uzbekistan. Comfortable and soft atmosphere of the restaurant «Old Arba»will wrap you with warmth and hospitality. Thanks to its friendly staff, you can relax and feel at a party of careful friends. “Old Arba ” is famous not only with its national and European dishes but also with variety of desserts. Here you can spend time with a cup of coffee and delicious cakes. Having been in the restaurant, make sure to taste the special dish “Bedana” (stuffed quail). It is cool here in summer, and it is warm and comfortable in winter. There is a VIP room for loves of oriental exoticism. 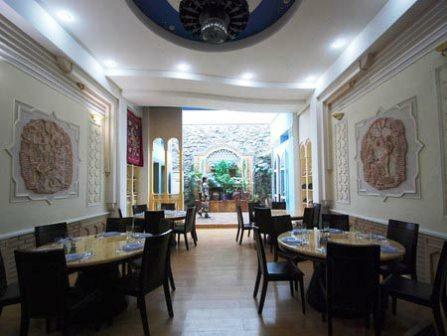 The restaurant “Old Arba” invites not only the residents of Samarkand but also the guests of the capital. Having visited the restaurant “Old Arba”, you will be sure that Samarkand people are very hospitable and friendly. Recommended dishes: bedona, haravats and meat in a rural. Working hours: from 9:00 am till 12:00 pm.